Recently, the pace of discovery has quickened, and many of the findings about T. rex, the other tyrannosaurs who were its relatives and the prehistoric lives they led is being celebrated with “T. Rex: The Ultimate Predator,” a new exhibition that opened on March 11 at the American Museum of Natural History in New York. The curators of the exhibition in New York are two longtime researchers on T. rex and other dinosaurs: Mark A. Norell, the curator of fossil amphibians, reptiles and birds at the museum, and Gregory M. Erickson, a paleobiologist at Florida State University. Norell said T. rex had helped foster a surge in dinosaur palaeontology over the past 20 years, evident in the rising number of researchers and new fossils, and in the increasing sophistication of techniques to study the finds. Other researchers, like Philip J. Currie, a dinosaur paleobiologist at the University of Alberta in Canada, agreed that the field had exploded. “More is going on now than ever,” he said. When he started in the 1970s, “there were probably only six of us in the world who were paid” specifically to study dinosaurs. Some, like the T. rex skeleton named Sue, which now stands in the Field Museum in Chicago, attracted international attention. Sue was found in 1990, the biggest and most complete T. rex skeleton ever. The museum paid $8.3 million (Dh30.5 million) for it. The reconstruction of another giant found shortly after Sue, known as Scotty, will be unveiled at the Royal Saskatchewan Museum in Regina, Saskatchewan, in May. Behind the scenes of the reconstructions of the greatest T. rex that curators can find, paleontologists are gathering a wealth of new knowledge about these dinosaurs. The findings are frequently driven by the discoveries of many fossils of smaller tyrannosaurs worldwide. Studies using CT scans, chemical analyses and new microscopic techniques have also illuminated the behaviour, evolution and sensory abilities of T. rex itself. Investigations of where and how muscle attached to the skull showed that its jaw had a bite strength of 7,800 pounds, enough to cleave the bones of other massive dinosaurs. Coprolites, fossilised faeces, showed the presence of partly digested bones, indicating that it had the stomach juices to cope with them. Judging by its relatives, and by fossilised footprints of a group of the dinosaurs together, T. rex was a social animal. It probably hunted in groups, certainly when it was younger. Its behaviour probably changed as it grew. When it was only half the length of a bus, it most likely ran a lot faster than when it was full grown. The dinosaur’s brain was big even for its size, suggesting higher intelligence than other dinosaurs. How T. rex came to be, and what its relatives were like, is at the heart of both the exhibition in New York and recent science. T. rex is just one species among many. The superfamily that contains the tyrannosaurs includes more than two dozen other dinosaurs. They date back to 100 million years before T. rex lived. “It took evolution a long time to make T. rex,” said Stephen L. Brusatte, a paleontologist at the University of Edinburgh and author of a recent book on dinosaurs. Most of the early tyrannosaurs were small, some as small as a chicken. Many were dogsize to deersize. (Just last month, a smallish tyrannosaur from North America was reported.) 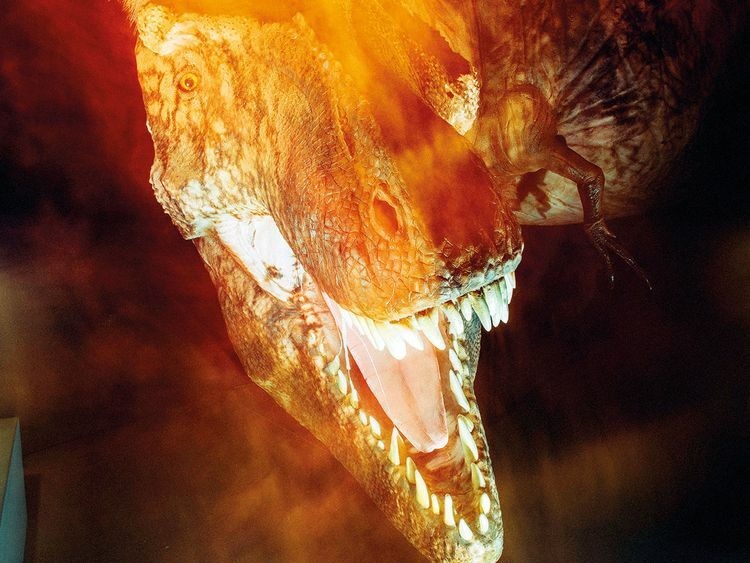 These earlier tyrannosaurs were not the top predators for most of those 100 million years. The rise of T. rex is a lesson in how evolution works, Brusatte said: with no preordained plan. Over the millenniums, many predatory dinosaurs appeared and disappeared. The tyrannosaurs were successful and over time evolved. But if other large dinosaurs like allosaurus had not gone extinct, there might not have been room at the top of the food chain for a creature like T. rex. It could be said that T. rex lucked out. But then, it ruled at the very time 65 million years ago when all the nonavian dinosaurs went extinct.